Rejection of Plaint—Limitation—For deciding an application under Order 7 Rule 11 CPC, the provisions of Article 54 of the Limitation Act are attracted. Cause of Action—Once the limitation starts running from first accrual of cause of action, it will not stop by subsequent enlargement of cause of action as per averments in the plaint. Comments Off on Rejection of Plaint—Limitation—For deciding an application under Order 7 Rule 11 CPC, the provisions of Article 54 of the Limitation Act are attracted. Cause of Action—Once the limitation starts running from first accrual of cause of action, it will not stop by subsequent enlargement of cause of action as per averments in the plaint. 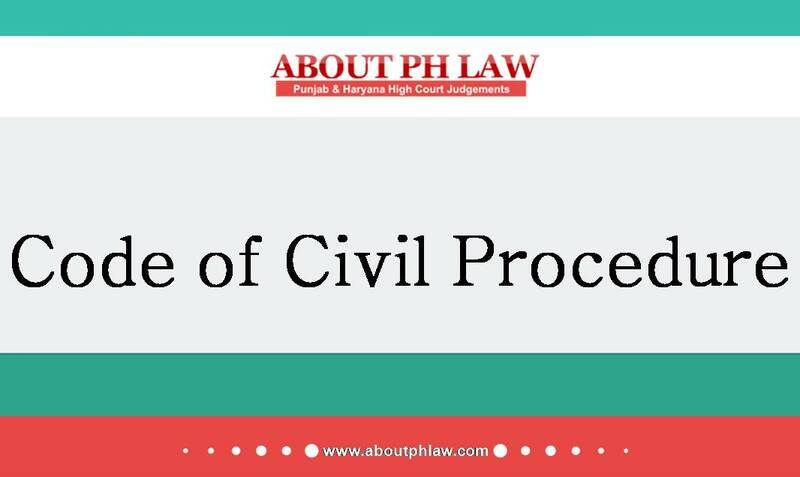 Civil Procedure Code, 1908 (CPC) – Order 39 Rule 1, Order 39 Rule 2, Order 7 Rule 11-Rejection of Plaint-Question of rejection of a plaint can be decided by the court suo motu without any application by the defendant and that also at any stage of the proceedings. Comments Off on Civil Procedure Code, 1908 (CPC) – Order 39 Rule 1, Order 39 Rule 2, Order 7 Rule 11-Rejection of Plaint-Question of rejection of a plaint can be decided by the court suo motu without any application by the defendant and that also at any stage of the proceedings. Rejection of Plaint—After withdrawal of suit, fresh suit not to be rejected on the ground that no cause of action survives. Comments Off on Rejection of Plaint—After withdrawal of suit, fresh suit not to be rejected on the ground that no cause of action survives. Wakf— Notified list—If any property had been omitted to be included in the list of auqaf by inadvertence or otherwise, then it was/is for the Wakf Board to take action within a period of one year from the date of publication of the Gazette notification. Rejection of Plaint—If clever drafting of the plaint has created the illusion of a cause of action, the court will nip it in the bud at the earliest so that basis of litigation will end at the earlier stage. Comments Off on Wakf— Notified list—If any property had been omitted to be included in the list of auqaf by inadvertence or otherwise, then it was/is for the Wakf Board to take action within a period of one year from the date of publication of the Gazette notification. Rejection of Plaint—If clever drafting of the plaint has created the illusion of a cause of action, the court will nip it in the bud at the earliest so that basis of litigation will end at the earlier stage. Rejection of Plaint—Suit cannot be dismissed being barred by limitation without proper pleadings. Comments Off on Rejection of Plaint—Suit cannot be dismissed being barred by limitation without proper pleadings. Rejection of Plaint—Factum of previous pleadings cannot be taken as a defence for rejection of plaint. Comments Off on Rejection of Plaint—Factum of previous pleadings cannot be taken as a defence for rejection of plaint. Rejection of Plaint—Once an application is filed under Order 7 Rule 11 of the CPC, the court has to dispose of the same before proceeding with the trial. Comments Off on Rejection of Plaint—Once an application is filed under Order 7 Rule 11 of the CPC, the court has to dispose of the same before proceeding with the trial.